In addition to describing some of the aircraft programs that have featured Hydra-Electric sensors and switches, Mr. Schmidt talks about the new sensor and switch designs the company brought to NBAA. These included products for solving the long-standing problem of contact resistance associated with the micro switch, and new approaches to address the single event effect in high altitude sensor applications, the former of which the publication covered in a front page article of it’s 2nd Edition during #NBAA18. 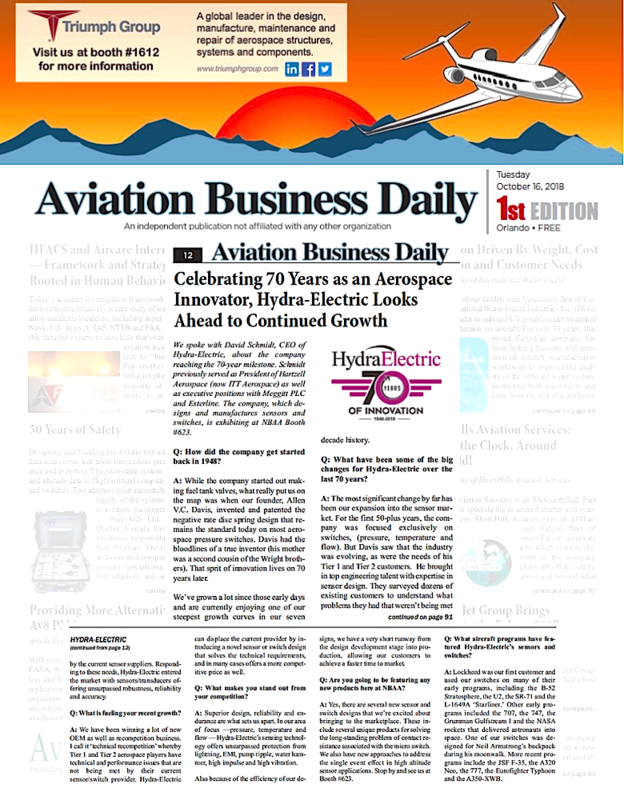 This entry was posted in #NBAA2018, 70th Anniversary, Aerospace Engineering, Aerospace Events, Aerospace Industry Events, Aircraft Sensor Design, Aviation History, Hydra-Electric News, NBAA, Press, Sensor technology and tagged 70th anniversary, aerospace engineering, aerospace industry, aerospace pioneer, aerospace sensors, aerospace switches, aerospace trade show, aircraft engineering, aircraft sensor design, Aviation Business Daily, aviation history, breakthrough sensing technology, business aviation, Hydra-Electric CEO, Hydra-Electric products, Hydra-Electric sensors, Hydra-Electric switches, sensor technology. Bookmark the permalink.